On November 1st, 1501, the expedition commanded by the Italian navigator Américo Vespúcio, by order of Pedro Alvares Cabral saw a “big and beautiful bay”, which was named All Saints’s Bay because of the date: All Saints’ Day. That was the official birth of the biggest bay of Brazil. 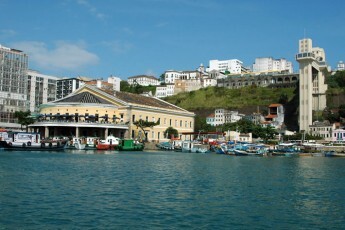 Set in one of the most beautiful national sceneries, with its calm and crystal clear waters, involved by a historical atmosphere and the Atlantic forest contrasting with large mangroves, sand banks and coral reefs, the bay is the starting point of the state that borrowed its name and keeps attracting tourists from all over the world with its enchants and magic. Because of the rich nature that surrounds the bay, the Government created the All Saints´ Bay Environmental Protection Area, which comprehends the waters and the 54 islands that belong to the cities of Salvador, Madre de Deus, Candeias, Simões Filho, São Francisco do Conde, Santo Amaro, Cachoeira, Saubara, Itaparica, Vera Cruz, Jaguaripe, Maragogipe and Salinas da Margarida, a total of 800km² of nature in all its splendor, with good touches of history.